Fernand Léger, a painter, sculptor, filmmaker and trendsetter, was best known for his influence on cubism and pop-art. He is viewed as a root of the cubistic movement and lauded for his ability to deconstruct reality and put it back together in a blunt and honest way. His style varied fluctuating between mechanical and organic, but he never strayed far away from bold graphics or primary colours. His artistic journey is particularly influenced by the Second World War. Léger was not the only artist jaded by the war. Felix Nussbaum also suffered throughout this time period, and looking closely, one can see the connection between the two artists’ work and their identity, heavily influenced by trauma. Léger’s childlike amazement with the glittering city life can be explained by his childhood in the south of rural France, an area lacking in such glitter. Born on February 4, 1881, in Normandy, Léger grew up in a family of cattle farmers. His father expected him to follow in his footsteps and at first discouraged his interest in an artistic career. He changed his mind when he saw his son growing more successful and starting to appreciate and encourage developing his talents. Léger never lost his touch with his rural origins. 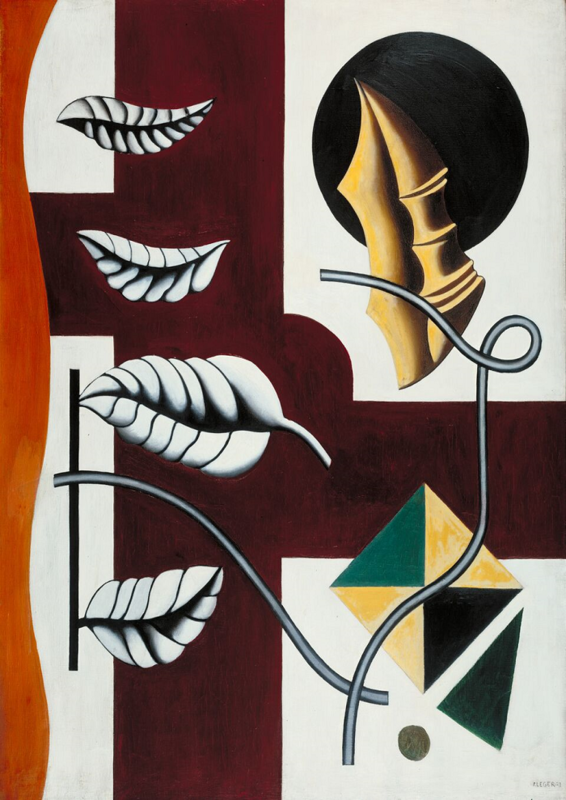 By the 1930s, Léger’s interest in democratising art increased. A painting like Study of Objects from 1930 from the Objects in Space series reflects his attempt to make contemporary art more accessible and comprehensive. The collage-like style and recognizable images in his studies is unpretentious and legible for a large audience. Beyond his own work, Léger began teaching painting to the local common workers. His work became more figurative and populist, as if he was speaking to a mass audience. Recurring themes in his pieces are dockworkers, builders and rural life. A fair part of the expo is dedicated to the works he made after the war. Following Léger’s time on the front-line at Argonne and Verdun, his painted figures became mechanical and deconstructed. There is a clear distinction between his portrayal of the optimism of the pre-WWI period, featuring strokes of primary colours, his paintings filled with the vibrancy and possibility of urbanisation. After the War his focus lies on destruction and dehumanisation of the body. It is interesting to see in his work the development from a peasant boy to a disillusioned soldier dealing with trauma.Nussbaum has similarly been formed by his upbringing, in particular by his identity as a German Jewish person. It is interesting to note the similarities and differences in their way of acknowledging trauma in their work. For Nussbaum, his religion starts off as an inspiration to him, but ends up being the cause of his persecution and demise, which is visible in his last pieces. In his early pieces, we see a confident young man just beginning his artistic journey. Later, as an exile, he returns yet again to reaffirm this identity by showing the bleakness of being persecuted in the Second World War. After the rise of Nazi doctrine, Nussbaum and his girlfriend led a life of uncertainty. This uprooted life caused Nussbaum to paint a series of melancholic, dark and gloomy self-portraits. 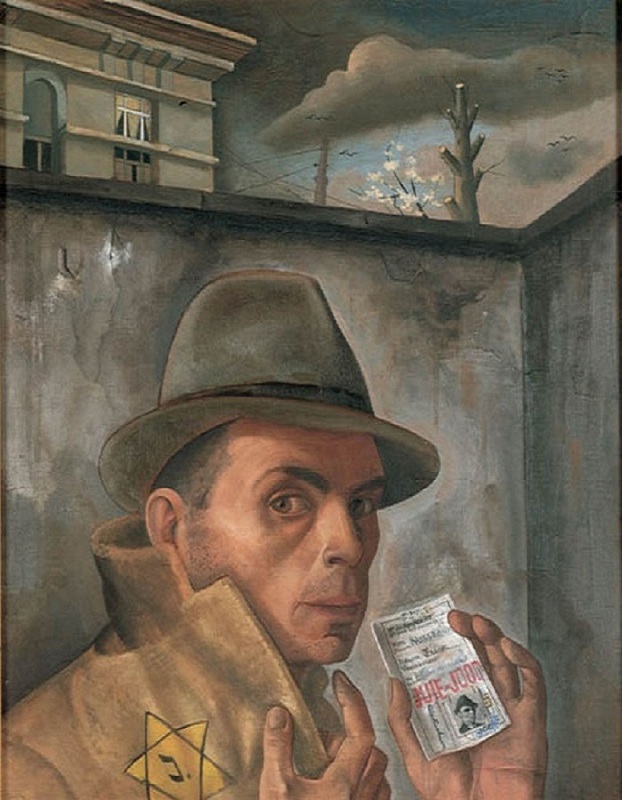 In 1943, little more than a year before his murder in Auschwitz, he painted one of his most striking and trenchant self-portraits titled “Self Portrait with Jewish Identity Card.” On this portrait, he is holding his ID-card, which has become a symbol of persecution, downfall and the threat of death. Nussbaum, different from Léger, addresses the dread of war by making his style more realistic and figurative, while Léger deals with trauma by going abstract and cubistic. They both, however, stay close to their own identity and roots, whether that is a religion or a rural upbringing; it stays with them and their art. The Léger exposition ends on a more positive note, as he returns to painting figurative compositions and the celebration of daily life. Sadly, Nussbaum did not get that chance; we might have seen a whole other side of him in his work if he lived through the war. Léger’s figures in the painting part of the expo, Gone to lunch … Study for ‘The Constructors’: The Team at Rest from 1950 are wide-eyed and innocent, and seem far removed from the android creatures he painted some years earlier. It seems like he wanted to get back to a more simple time, reminiscent of his pastoral youth. Léger’s work has the same abstract intricacy Kandinsky, Picasso and Braque, who are all considered founding fathers of cubism. Léger is lesser known amongst the public, perhaps because he was less hard-core about his art being abstract. He quite naturally and fluently changed his style according to what situation he was in, whether that meant Parisian city life, or the battlefield of Verdun. His affiliation with architecture, something he shares with Kandinsky, Picasso and Braque, combined with his open-minded approach to art has led his work to be completely 3-dimensional and multimedial. The Tate shop sells items printed with his art, which at first seems quite ironic, considering Léger frequently commented on consumerism. Then again, he strived for art to be totally accessible to all, and nothing says accessible to the general public like a tote bag or a beer mug with Léger print. The political undertone of Léger’s work does not overpower the remarkable personal feeling of the expo. It really shows the development Léger went through, from rural upbringing to bustling metropole. It brings together major loans from lenders from all over Europe including Centre Pompidou, Fondation Beyeler, and Moderna Museet in Stockholm. This exhibition includes works never shown in the UK from all over Europe and features collaborations with architects Le Corbusier and Charlotte Perriand. Exhibited for the first time in the UK and the main highlight of the exhibition is the large-scale photomural Essential Happiness, New Pleasures 1937/2011. This collaboration with Perriand first appeared at the International Exposition in Paris in 1937. This work is the epitome of his socialist ideals and a perfect example of his pastoral approach to the depiction of rural life. Also on display is his experimental 1924 film, Ballet Mécanique. The rhythmic portrayal of kitchenware – whisks, lids and tins – together with a woman carrying a heavy sack expresses Léger’s concern for monotony and the lacklustre of life during this period of technological and mechanical upheaval. 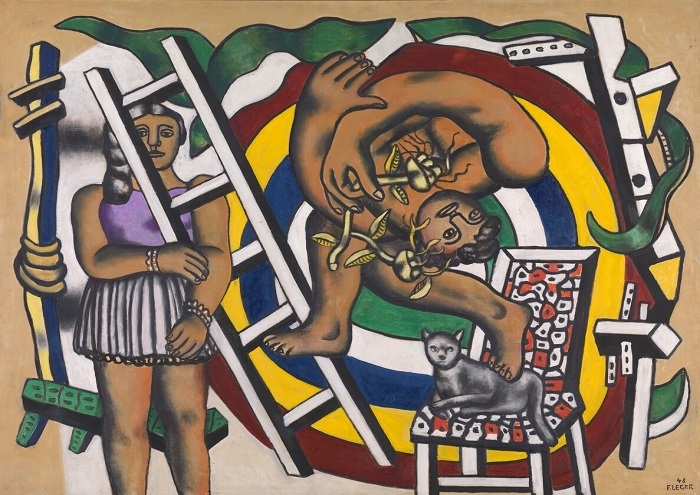 On the 23rd of November 2018 until the 17th of March Tate Liverpool is showing 40 works by Fernand Léger. The exhibition Fernand Léger: New Times, New Pleasures celebrates 30 years of his work and highlights his interdisciplinary approach to art. The exhibition is curated by Darren Pih, Exhibitions & Displays Curator and Laura Bruni, Assistant Curator, Tate Liverpool. It was initially developed by Lauren Barnes, formerly Assistant Curator, Tate Liverpool. It will tour to IVAM – Institut Valencià d’Art Modern from 2 May to 15 September 2019..